My 2 year old is just beginning to get the hang of rhyme and we often have fun at the dinner table making up rhymes for words. 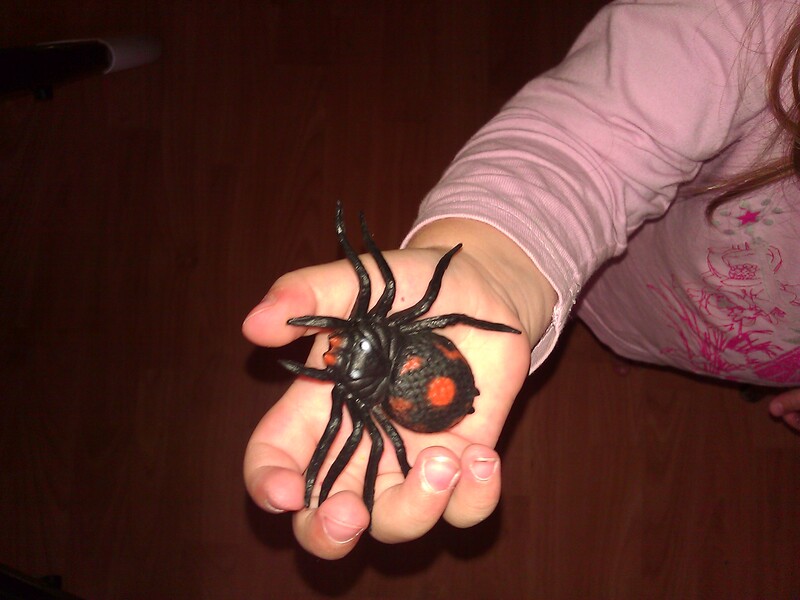 This morning at breakfast the girls found a plastic spider and I remembered a song that I used to sing with the children at nursery. There’s a spider on the floor on the floor. The children then choose where the spider should go next. My 7 year old chose her head and rhymed it with bed. This was a bit advanced for my 2 year old but she enjoyed choosing parts of the body – it was a great fun activity, that they could both join in with at their own level and engaged them for about 10 minutes. They liked it when I made up funny verses e.g. There’s a spider on my knee please don’t fall in my cup of tea. Fun like this reminds me of the reasons I like to sit with the kids at mealtimes. Previous PostLeapfrog Maths Adventure to the Moon–A Review and the chance to win one of 3 copies.Next PostIs there any value in pre-schoolers using iPads? My two year old is afraid of every single, small living creature. I’ll have to wait for her to grow out of it before playing this game!